The subject of today’s podcast is the most popular folk saint in Mexico, the Santa Muerte. She has many names including La flaca (“the skinny girl”), La hermana blanca or la niña blanca (the white sister or white girl), La huesuda (the bony one), La madrina (“the godmother”) and La niña bonita (“the pretty girl”). Often times she is referred to in the superlative and is called La Santisima Muerte, or “The most holy death.” With tens of millions of followers, the reach of the Santa Muerte extends across the border as well as her believers have increased in number in the United States over the years. So who is this often hideous-looking saint? La Santa Muerte – or in English, Saint Death or Holy Death – is personified as a hooded and robed skeleton figure holding a scythe and a globe. She is often holding an old fashioned scale or balance and is sometimes accompanied by an owl. Sometimes she is also holding an hourglass. 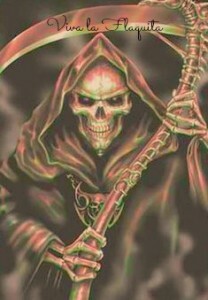 Many of her depictions look like an illustration off of a heavy metal band t-shirt, as her imagery closely parallels that of the Grim Reaper. She is dressed in different colors for different occasions and serves multiple purposes. Her veneration is looked down upon by the Catholic Church and has been called “demonic” and “anti-Christian,” yet she is followed by millions, mostly the marginalized, the dispossessed and those who have given up all hope. Anthropologists have called this type of veneration a “cult of crisis” in that it comes out of times of dire social and economic hardship. As economic times have worsened in Mexico and while violence has increased, we see an increase in people putting their faith in the skeleton saint. No one knows exactly where this saint came from, although the imagery suggests that part of this phenomenon came from the Grim Reaper of European legends. 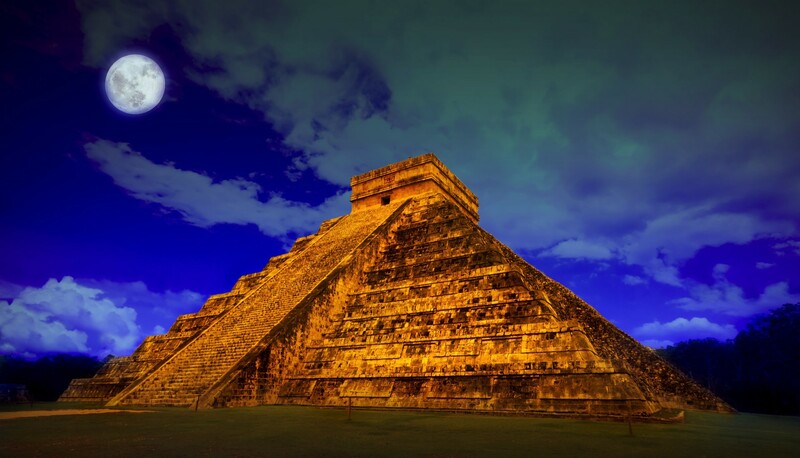 The context – Mexico – suggests that part of the phenomenon came from the Aztec goddess Mictecacehuatl, or “Lady Death,” the ruler of the underworld. Its modern usage and increase in popularity in these times also stem from modern circumstances. So, we have what the anthropologists call a syncretic belief system, one that blends two or more beliefs to come up with something different. The reverence for the Santa Muerte began in the 1960s, but its rapid growth has occurred only in the beginnings of the 21st Century when her veneration became less secret and more overt. The main shrine to this folk saint only appeared in 2001 when a woman from the Tepito area of Mexico City named Enriqueta Romero decided to display publicly the 5-foot-tall statue of the Santa Muerte given to her by her son. Now, there are many similar shrines throughout Mexico, but this is the oldest and most attended. Every first of the month there is a special rosary said at the Romero shrine and people bring their statues and santa muerte articles to be blessed. As the Santa Muerte is not an officially recognized Catholic saint, she doesn’t have a feast day on the Catholic calendar. Some people celebrate her day on the 15th of August, the 15th of September or November 1. The services performed at the Santa Muerte shrines, including masses and rosaries, are always done by lay people. Behind the Virgin of Guadalupe, the Santa Muerte is the second-most venerated religious icon in Mexico, surpassing St. Jude, the patron saint of the impossible, in the early 2000s. So, what does the Santa Muerte do and who exactly are her followers? As mentioned before, she appeals mostly to the marginalized and the dispossessed. People who feel like the Catholic Church has forsaken them have been drawn to this folk saint. This includes the incarcerated, homosexuals, prostitutes, petty criminals, drug dealers and the chronically poor. She has also become the patron of people who work at night and who need protection during the dark hours like taxi drivers, bar workers and so on. She functions much like a regular Catholic saint in that you petition to her for help or give her thanks for favors or miracles granted. As she has wide appeal, the Santa Muerte serves many functions. People pray to her for matters concerning love, health, money, legal issues, and pretty much anything else you can think of. In a major departure from the other Catholic saints, the Santa Muerte is often called upon to work a curse upon an enemy or to exact revenge. Her main function, though, is to provide a smooth transition from this life to the next. Most devotees pray for an “easy death” in the face of an increasingly violent and desperate world. Just as with the Grim Reaper of Europe and the Aztec death goddess Mictecacehuatl, you need to respect death in order to ensure a pleasant death and you do this by giving offerings, praying and by lighting candles. Lighting candles is an important feature of the veneration of the Santa Muerte. Different color candles are lit depending on the different requests of the devotee. Before being lit, the candles must be rubbed all over the person’s body to ensure that the energy and intentions of the devotee are transferred to the candle. Blue is used for healing of the sick and also for wisdom. Green is used for legal problems. Yellow or gold is used for money. White is for giving thanks. Red is for love. Multicolored is for everything. Black is for calming, but it is also used to counteract negative magic, for protection against enemies or to invoke a curse. Offerings left for the saint include cigarettes, alcohol, money and fruit, especially apples. Visitors to shrines often blow cigarette smoke in her face for luck. The Catholic Church has a problem with the Santa Muerte for various reasons. 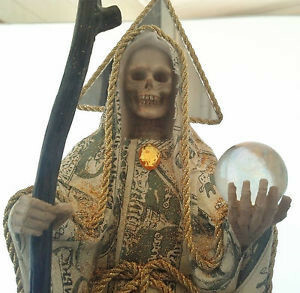 On his last trip to Mexico, Pope Benedict the Sixteenth chastised followers of the Santa Muerte and claimed that the whole phenomenon was a cult. Some say that the Church is upset because it doesn’t have control over the Santa Muerte movement or that it simply doesn’t understand it. The Church however has said that praying to the Santa Muerte is counter to some of the basic teachings of Christianity. Christ came to the Earth to fulfill the promise of eternal life. Death equals sin and therefore praying to death is in direct opposition to turning to God through Jesus Christ for salvation. Death is a phase of life, not a person, and to have a good death the church says one must have a good life and observe the sacraments. The staunchly religious completely reject the Santa Muerte as the tool of Satan used to trick people into a false devotion. Just in the past 15 years, the Santa Muerte has become one of the most controversial topics in Mexico. Can one be criticized for one’s faith, even if it is in a skeleton-faced lady who grants curses? Is this just another example of an object of intention having a desired psychological effect or are there larger forces at work here connecting people in a roundabout way to the Divine? You be the judge. A wonderful film in Spanish narrated by Gael García Bernal and produced by Eva S. Aridjis in 2007 was simply called La Santa Muerte and provides a good overview. Devoted to Death: Santa Muerte, the Skeleton Saint by R. Andrew Chesnut. La Santa Muerte: Unearthing the Magic & Mysticism of Death by Tomás Prower. Santa Muerte Rituals: Santa Muerte Prayers and Rituals by Lazarus Corbeaux. Wow. Never heard of Santa Muerte before. Interesting and strange. Okay, here we go. I find it funny that Pope Benedict XVI thinks it’s wrong for people to pray to Santa Muerte, but not for people to pray to any other saint. According to the Bible Jesus Christ says that there is no way to the Father but through Him! If Catholicism condones prayers to their saints why not include poor, l’il Santa Muerte?! By the way, the photo at the top of this post upper left hand side is seriously scary! Thanks for the interesting article. Grear work!! I spent a lot of time in Mexico as a young adult. Puerto Penasco, Guaymas on dive trips. This cult phenomenon is the manifestation of a nation giving up hope in government, economy, family, and faith in God within their daily lives. It is witchcraft, plain and simple, and reverence to this “saint” is exactly why Mexico has degenerated into such a hell hole from the cartels: shes the new god, and the real God refuses to bless a nation who turns away from Him to worship another. This idol is the idol of instant gratification, of envy, greed, lust, indulging in revenge/malice. Adherents to this cult or short on humility and forgiveness, but embrace pride, manipulation/control over others, and universally reject the value of hard work. The santisma muerte is the dark angel on the shoulder of drug dealers and cartel thugs. It is the witchcraft of the weak-minded. This new religion, and similar santaría, closely follows (precipitates) Mexico into its decline. Yes, this is a group of sentiments echoed by many. Thanks for commenting. Jamey S Honaker . I couldn’t agree with you more 👍 What you said is so true .